According to financial planning website LearnVest, men are five times more likely to prioritize investing than women. Men are also more confident about their financial knowledge and investment prospects. This disparity may contribute to the wealth gap between the sexes. There is a simple solution: more women need to become investors. 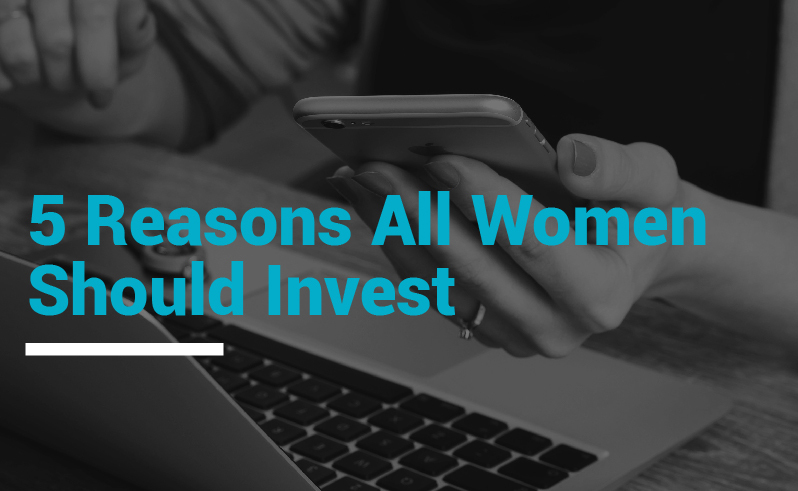 In fact, all women should participate in the investment community, and there are at least five very good reasons why. Despite the fact that women generally report being less confident about their financial knowledge, research regularly shows that their investment portfolios outperform men’s. Experts chalk this fact up to the fact that male investors tend to be overconfident, trading stocks too frequently and taking unnecessary risks. Taking risks can sometimes yield good results in investing, but it can also cause financial catastrophe. If investment goals are kept realistic, a moderate strategy focusing on building wealth over time is the best bet for securing a bright financial future, and this is where women seem to excel. As more of them try their hands at investing, many will find that it’s not as intimidating as they’ve been led to believe. They may also find that they have a knack for it. Income inequality may be the issue talked about more in the media, but wealth inequality is far more sinister. Income is the amount of money taken in by an individual in a year, while wealth is the sum total of all assets (money, property, investments) an individual owns. You may have heard that women make an average of 79 cents for every dollar earned by white men (even lower for women of color), but did you know that single women only own 32 cents for every dollar owned by single men? Investing has consistently been one of the best ways to build and maintain wealth (not income) over the long term. And wealth is more than a statistic: it is a safety net in case of emergency, a cushion for old age, and the key to leaving a better life for our children and loved ones. More female investors may hopefully signal the beginning of the end of our out-of-control wealth gap. It’s an unfortunate reality that women are much more likely to have life get in the way of their careers than men are. Many women choose to, or are forced to, take breaks from working during and after a pregnancy, and when they are ready to return, they often suffer the effects of an employment gap, such as lower pay and reduced employment options. Positive investment habits can help to alleviate this burden and allow women to feel comfortable with taking time away from work to raise a family, or just because they want or need a break. A strong portfolio can provide a safety net, or even a moderate source of income, during these extended breaks from work. And since 1 in 4 women end up taking an unplanned career break during the course of their life, it is important to begin investing to build wealth as soon as possible. A less unfortunate reality (for them, at least) is that women tend to live longer than men. This means that most will, at some point, be financially independent, and that number is growing with each generation. Investing is the most tried-and-true method of building wealth for retirement, and since women generally have more golden years than men, logic would dictate that they would need more in retirement savings. Unfortunately, many are not able to achieve this goal, and women are 80% more likely than men to retire into poverty. By building good investment habits early (as early as possible! ), women of all walks of life can avoid this fate. Investing into an IRA or 401k and following the tried-and-true formula of starting off aggressively and becoming more conservative as time goes on can help ensure a happy and comfortable retirement, free from money troubles. The worlds of business, investment, finance, and entrepreneurship have long been dominated by men. Thankfully, that is changing as the country adopts more progressive social attitudes. Thus, female-led entrepreneurship is set to grow at a dizzying pace in the near future. With more and more women both investing and starting their own companies, the landscape will begin to shift. Women will naturally invest more in each other, further spurring change towards equality, and their entry into the markets could provoke extra growth. Impact investing is already growing rapidly as more young people with socially-responsible investment goals begin investing, and as more women join the investment community, this expansion will only quicken. This means more capital put towards solving society’s problems, and in the long run, a better world for all. Given all of this, it’s hard to argue that an increase in the number of women making investments in stocks, bonds, and other securities is anything but a massive boon to America and the rest of the world.